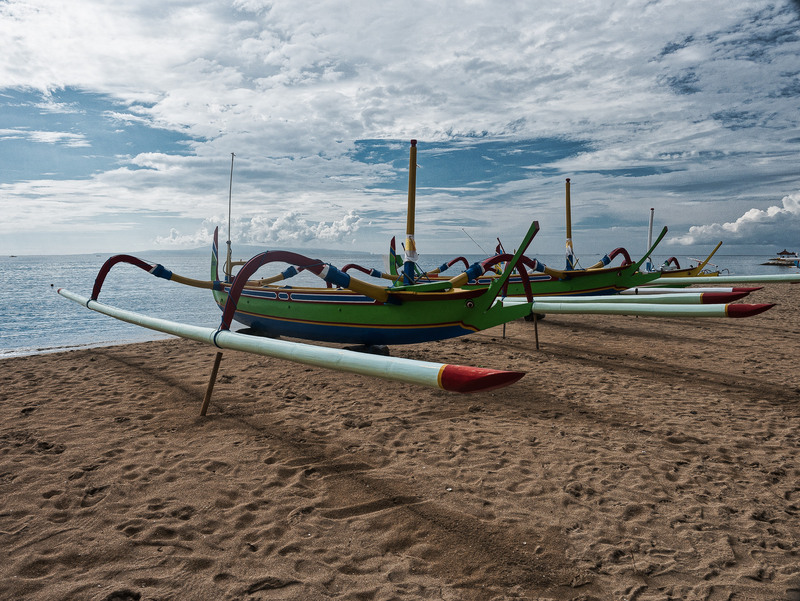 Sanur is considered the original upmarket tourist destination on the Indonesian island of Bali, and remains a photographically spectacular place today. The long beach looks over towards Nusa Penida island (which can be seen in the background of this image). I only had a couple of days in Bali on this trip as I was visiting for a seminar, so didn’t have the flexibility to shoot at the times that would have better suited. That said, I did enjoy the chance to explore the beach, and really liked the traditional fishing boats all along. The challenge here was isolating the subject. The beaches are busy, and there is a lot going on. I managed to isolate the image nicely and using a polariser I reduced the glare of the mid-morning sun. After shooting the Roman Forum one dawn, we visited the site, easily spending a good half day exploring the various Roman ruins. It was a brilliant Rome day, with beautiful weather, but some fairly ominous clouds came over the site, providing quite a spectacular sky. I found a composition that I liked with the column and dome. As shot, the image had some distortion with the straight lines of the column and the building on the right leaning inwards. I fixed the image with DxO ViewPoint 3. Check out my Italy 2017 Photo Gallery. I’m borrowing an idea I picked up on the interwebs — I think from Brian Matiash — to include some basic image data in these blog posts. So I will experiment with including camera (C), lens (L) and editing (E) details in brief. I might also add in data such as other accessories (filters, lights, etc). 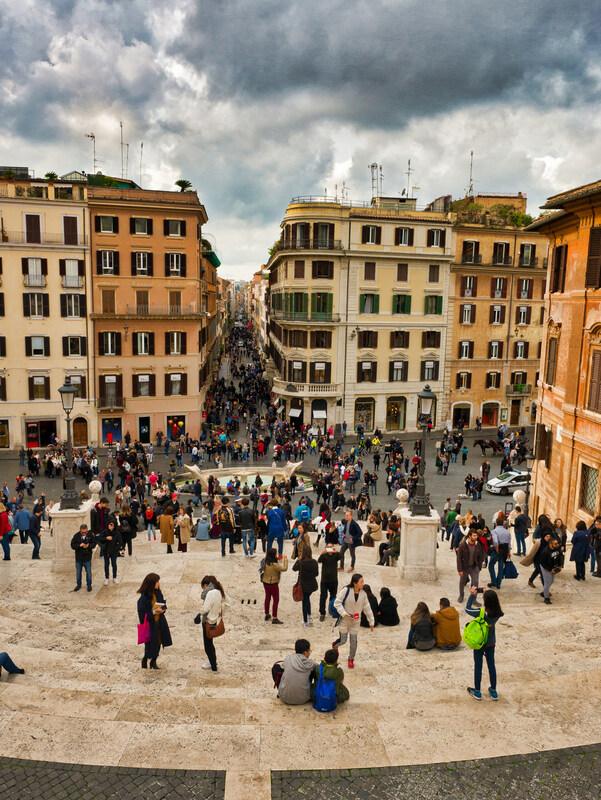 Rome, the eternal city, is an amazing place for photography. The thing about the capital city of Italy is that it a beautiful mix of the old and the new. Buildings that are hundreds, even thousands, of years old are still in daily use in a city that is also a modern world capital. There are so many landmarks in Rome, but a great starting point for photography has to be the Vatican view along the Tiber River from Ponte Umberto I. This magic view allows a composition with the Vatican on one of the ‘rule of thirds’ intersections, the Tiber River as a strong foreground feature and the Ponte Sant’Angelo and the sky framing the Vatican. In the evening the sun sets at the rear of the image, and the autumnal colours in this image really provide a balance to the greys of the architecture. After our week on the Amalfi Coast, Ponte Umberto I was our first stop for sunset photography in Rome. This image was made before the sunset and contrasts well with a blue hour image made from the same position. Like most people who have been around the internet for a while, I get a lot of email. Much of it is spam – and most of this never makes it to my inbox due to spam filters in place. But even after taking out the spam there is still a lot of low priority/importance email that really doesn’t need to interrupt me when it arrives. Sanebox works brilliantly, and behind the scenes by quietly analysing your email habits, and sorting the emails you receive so that those from your key contacts go into your inbox, and other emails go into a “SaneLater” folder. This pre-sorting means that a small volume of messages go straight to your inbox, leaving the bulk of low priority email for later review. This triage takes a lot of interference out of email. When I am out and about accessing email through my iPhone or iPad, or in the office focused on core work, I can simply ignore the low priority stuff. Sanebox makes it easy to “train” contacts so that they appear in the correct folder. Sanebox has additional features that allow you to defer emails until a later date. For example, placing an email in the “SaneTomorrow” folder will take it out of your current view, but place it back in the folder from which it came (Inbox, SaneLater or other) the next day. There are also options for handling mailing list or bulk emails, and reminder services to ensure that you don’t lose track of important messages you send and need a reply on. Sanebox has been around since 2010. Since then other providers have launched similar functionality, most notably Apple with their VIP mail in iCloud, and Google with their Priority Inbox feature. Sanebox has continued to offer a paid service against these powerful newcomers. The ability for Sanebox to meet its goal of brining sanity to your email is perhaps demonstrated best by what happens when it has brief, unfortunate, outages. For only the second time I can recall in the year or so I’ve been with Sanebox, yesterday there was a significant downtime – about 10 hours. The Sanebox team communicated through Twitter and today followed up with a blog apology for the Sanebox outage and an email from the CEO. I am an advocate for the concept that the true test of a service is not what happens when everything is plain sailing, but how issues are dealt with when faced. In this regard, there are two thoughts I want to share. Firstly, my experience during the outage was not a loss of my email, but a loss of the behind-the-scenes filtering. Thus I lost no email, but had a much fuller inbox. It was a significant reminder of just how much of an incredible difference Sanebox makes to my email experience. Provided compensation in the way of a free week of service to Sanebox users. Two major outages in a year, totalling less than 20 hours, equates to an uptime of around 99.8%. Problems do happen, and providers need to learn from them and improve, just as Sanebox appears to be doing. My annual renewal for Sanebox is a few weeks away. I’ll have no hesitation in renewing, based on the awesome difference Sanebox makes in my email experience, as well as the way they handle issues. I had a scary experience over the last couple of days, which I resolved this morning. I’m working on an important project for a client at the moment, and had a bunch of annotated files saved to iCloud’s Documents in the Cloud feature from the excellent PDF Pen app, which I use on both the iPad and my Macs. I had manually deleted a few unrelated files, and when I returned to the app on iPad, all my files were missing. So I checked on my MacBook Air and my iMac, and same story. Gone! At this point, I had lost a bit of faith in the iCloud promise (which I am otherwise liking), and was certain that the problem was either a software issue (Smile Software’s implementation of iCloud), or with iCloud itself. After calming down, I realised that it was probably user error, but that wasn’t getting my documents back. In the Finder, hold down the Option key, click on the Go menu, and choose the now-visible Library command. Locate and open the Mobile Documents folder. Within you’ll find multiple folders. In your case you want the com~apple~mail folder. Inside you’ll find a Documents folder. Within it is your PDF file. Now this didn’t address backups, but it did make think that if there is a local copy in the file system, then my Time Machine backups may well have a copy of my missing documents. The next problem was that the “Library” folder in Finder is hidden, and while the Option-Click approach above works well for finding current documents, I wasn’t sure how to approach this in Time Machine. A quick visit to Dr Google found the CNet article How to access hidden files to restore in Time Machine. Unfortunately, if you have removed a hidden directory that is within a normally visible directory (as is the case with the entire /etc directory), then the Finder will not allow you to see it by default, so using the “Go to folder” command will not work. Nevertheless you can still restore it using Time Machine by first showing hidden files in the Finder. Once you’ve done this, enter Time Machine as usual, browse to the dates you’re looking for, and go to the Library>Mobile Documents folder, and you’ll see a list of folders for iCloud Documents, sorted by app. Find the right folder, and you should see the files in the iCloud for that App on that Date. Select and Restore, and you should be good to go. Its kind of nice when things work out! Everything I needed was there, I just had to do some digging. Given that its more than possible that other users will make silly errors like mine, I wonder when Apple will make this type of restoration more seamless. Whilst its easy to use the Revert To function to go back to previous versions of a file within a given app, it doesn’t help if you’ve deleted the whole file. In the meantime, I hope this workaround works for others. The excellent TotalFinder application provides many extensions to your OSX Finder, including the ability to easily “Show System Files”, restoring access to the Library and and other hidden files.